All hail cruciferous vegetables, with this mouthwatering cauliflower ‘steak’! These flavourful roasted cauliflower ‘steaks’ will delight Brassica lovers and convert skeptics. They are bursting with savoury goodness and leave you feeling satisfied without the “ugh” of heavy meals. 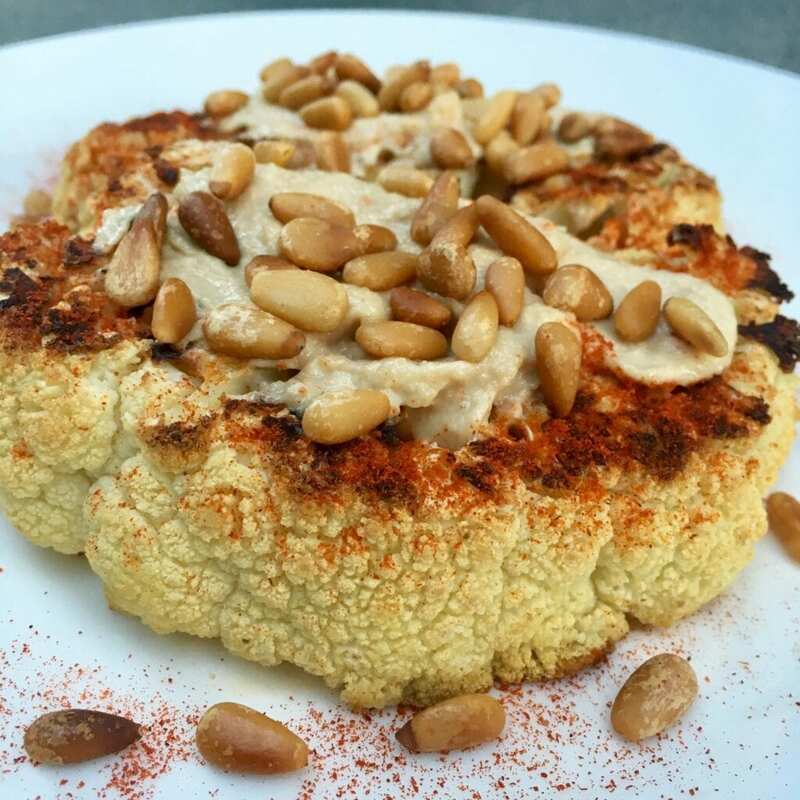 They pack a nutritional punch thanks to the powerful combo of cauliflower and seeds galore (tahini and pine nuts). These ‘steaks’ look (and taste) good enough to impress guests, or to make a home dinner feel like a date, yet anyone can pull them off. Cauliflower belongs to the Brassica family of cruciferous vegetables, along with broccoli, kale, bok choy, collard greens and brussel sprouts. These vegetables can be quite divisive – some love ’em, others hate ’em. Your genetics play a role in preference because bitterness sensitivity has a strong genetic basis. Yet, it is clearly not the whole story. Many bitter tasters happily embrace this family of veggies, while some non-tasters shun them. Clearly, other factors matter a lot too, notably repeated exposure and cooking them in ways that mellow their bitterness. One benefit to this family of veggies is that they are low in calories yet very satisfying, presumably due to high fiber and high water content. They are also low in carbs, and remarkably high in protein, rivalling ground beef on a per calorie basis (read more here). They are also high in antioxidants (especially vitamin C), like many other fruits and veggies. The health benefits of Brassica veggies MAY go above and beyond those of other veggies, with some reports of anti-cancer and hormonal balancing benefits. Their unique sulfur-containing compounds give them their distinctive taste and smell and are though to be play a role in their health benefits. However, bear in mind that many of the reported “above and beyond” health benefits are based on association studies and not – yet – proven by controlled studies. Read more about the science of flavour, the role of genetics in bitter taste, and the evidence for health benefits of Brassica vegetables. My version of this recipe is a “mashup”. I paired roasted cauliflower ‘steaks’ from Jessica Gavin with a delicious lemon tahini sauce from Serious Eats. I finished with paprika and roasted pine nuts. Slice cauliflower head into ‘steaks’ (read details here). Lightly coat both sides of ‘steaks’ with olive oil (I like to use a pump like this to keep it light and even). Cook in super hot oven for 15 min – the ‘steaks’ should be golden. While cauliflower is cooking, prepare the sauce (source: Serious eats). .Combine garlic and lemon juice in a blender. Pulse until a pulpy puree is formed, about 15 short pulses. Transfer to a fine mesh strainer set over a large bowl. Press out as much liquid as you can with the back of a spoon or a rubber spatula, then discard solids. Add cumin and tahini paste to lemon/garlic juice and whisk to combine. The mixture will seize up and turn pasty. Add water a few tablespoons at a time, whisking in between each addition, until a smooth, light sauce is formed. The tahini sauce should very slowly lose its shape if you let ribbons of it drop from the whisk into the bowl. Season to taste with salt. Lastly, toast your pine nuts if desired. Place in a dry frying pan on medium heat and keep moving them around the pan for a few minutes. Don’t take your eyes off of them, they burn very quickly! When ‘steaks’ are golden, remove from oven, and let cool briefly. Place ‘steaks’ on serving plates. Sprinkle optional paprika. Smear tahini sauce on top and finish with toasted pine nuts. Credit: Thank you, Jessica Gavin for the cauliflower steak cooking tips, and serious eats for the killer tahini sauce. Thank you also to Granny Annie for introducing me to the latter.